I have had my Stampin' Up! Goodies out to play with this week and created a cute Happy Birthday card showcasing products from the It's My Party Suite in the new 2016 Occasions Catalogue. This is such a fun card and suitable for any age. The Balloon Bouquet Punch co-ordinates perfectly with this range of papers and adds dimension to the card. Not only have I used it for the pretty coloured balloons seen on the card, I have also used it to create the embossed background. Here's a close up of my background. Greetings and banner used on the card are from the Number of Years Stamp Set and Framelits Bundle also featured in the Occasions Catalogue. 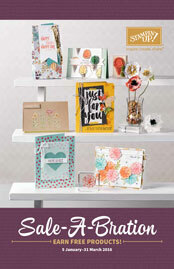 If you wish to purchase any of the Stampin' Up! product used on this card or from the 2016 Occasions Mini, please contact me to place your order. Happy New Year to you all who occasionally check in to see if I am still blogging lol! Today sees the release of the brand new 2016 Occasions Catalogue! You will notice that I have updated my button over on the right and you can now click on the Occasions Catalogue image to view it. January also sees the fabulous annual Sale-a-bration extravaganza mini released as well. Now if I have done my job well you should be able to click on the above image and it will open up the catalogue and you can see all the FREE goodies on offer this year for every $90.00 you spend. Enjoy your time browsing and as always contact me if you have any questions of if you wish to place an order.